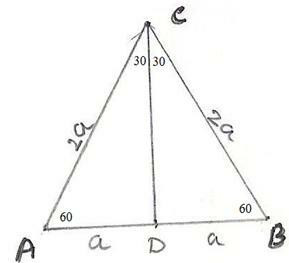 Therefore ABC is equilateral triangle with AB=BC. When angle A approaches 900 (hypotenuse becomes Opposite Side ) the length of Opposite Side and hypotenuse become same and length of Adjacent Side becomes zero. When angle A approaches 00 (hypotenuse becomes Adjacent Side itself) the length of Adjacent Side and hypotenuse become same and Opposite Side becomes zero. For values of = 0, 300,450,600 and 900 let us draw the graph for sin, cos and tan. 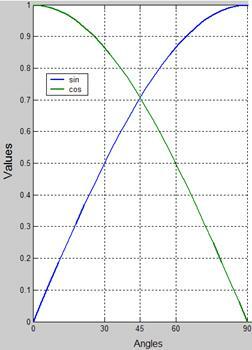 First graph has values for both sin and cos represented by blue line and green line respectively. The second graph is for tan. 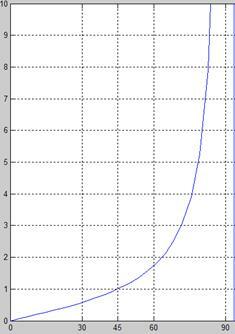 3. with the increase in angles, value of tan increases from 0 to infinity. Exercise : By substituting A = 300, 450, 600 and corresponding values for sin, cos, sec, tan, cosec, cot observe that equations in Problem 8.2.1 are true. Similarly the other statement can be proved. Exercise : Verify the statements in 8.2 Problem 2 when (A,B) = (600 ,300 ), (300 ,600 ), (00 ,900 ) , , ,using the values in the table for special angles. This proves that A=30 is one of the solution. Similarly verify that A=0 also satisfies the relationship. sin2 60+cos2 (3x-9)=( /2)2+1/4=3/4+1/4 = 4/4 =1 which is RHS of the given equation. Draw a rough diagram as in the adjacent figure. 3. Use value for sin20 (=0.342) from sine table to get the length of PO.